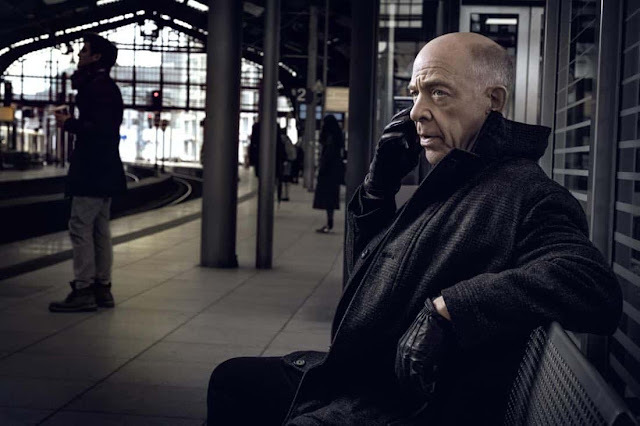 Article first published as TV Review: COUNTERPART on Seat42F. COUNTERPART is a new drama premiering on Starz tonight (though fans of Outlander might have already seen the pilot, which aired ‘sneak preview’ style after the recent series finale). The story follows a mild-mannered man who has spent his career in an unsatisfyingly low-level job within a secretive part of the UN. Said man, Howard Silk, has his life suddenly disrupted when he finds out that his employer is actually guarding a gateway to a parallel reality. And he learns this because a tough, commanding version of himself crosses over to defect and help them stop a serial killer. J.K. Simmons (Whiplash, Spiderman) is brilliant as both versions of Silk, the leading role he deserves. Simmons is one of those performers who got the supporting player and character roles for far too long, but can totally handle headlining. It almost seems like COUNTERPART is making it up to him by giving him two such roles at once, and complex ones at that. For Simmons alone, I would like to watch this show. He is joined by a brilliant supporting cast. Harry Lloyd (Manhattan) plays his boss, Peter Quayle. Olivia Williams (Manhattan) is Silk’s wife, Emily, who seems to have quite a different relationship with the protagonist on each side. Jamie Bamber (Battlestar Galactica) is Emily’s tool of a brother. Sara Serraiocco (Worldly Girl) is the enigmatic, gender-fluid assassin. There are quite a few more characters, too, but these are the ones that stand out the most in the pilot. In terms of genre, COUNTERPART crosses a couple of them. Its narrative structure is that of a spy thriller. There’s a cat-and-mouse aspect to the espionage, and real danger. Violence is a tool, not the point of it all, and there is plenty of mystery. There is a Cold War feel to the hunt, two sides who could cause great damage to one another, staring across the abyss, full-fledged conflict threatening to erupt. And, of course, one cannot deny the strong science fiction aspect. Speaking to the sci-fi, there is a promising premise here to be explored. It’s interesting that they establish these two realities used to be one, splitting off at a defined point. Given how different things have gone on each side, one really wonders about specific events and their importance. I think it would behoove the show to explore the past as well as the present as the tale unfolds, as viewers will be curious at how some of the divergences happened. Plus, we don’t yet know all the rules of the separation and what might be done, nor much about the code work Silk was doing, which definitely seems to have larger meaning than we see in episode one. In short, I really, really dig COUNTERPART. While it shares some familiar elements with other series, it also appears to have its own, strong identity, and a rich world to explore. I have no idea where things are going, which is a big plus on a show like this, but I can’t wait to see them play out. With the stellar cast, especially Simmons, it seems likely that even weaker moments will play well. Though, the pilot seemingly lacked those weak moments, which hopefully keeps up as the show goes on (always an iffy prospect for high-concept sci-fi, which often stumbles when forced to explain everything). Starz has a great series here. I only wonder why they didn’t keep it paired with Outlander. I feel like there is enough common DNA, though the two shows are very different, that it could keep some of the same audience. True, Starz might want to maintain the viewers when Outlander isn’t on, but they seem like such a natural pairing, it looks to be a missed opportunity to air them in different seasons. COUNTERPART premieres tonight at 9/8c on Starz.